The hesitation and delayed adoption of NFC in retail outlets worldwide is understandable. The cost of compliance will be expensive for merchants let alone waiting for consumers to buy NFC capable smartphones. Surveys indicate that smartphone usage is most popular for gaming activities and that because markets are saturated with older handsets the adoption of smartphones generally, is retarded. In emerging economies such as China and India the adoption rate is much higher. There are many other reasons of a socio-technical nature related to mobile technology adoption being researched. Privacy, Trust, Education etc. For smartphone users and merchants an alternative to NFC compliance requirements gaining rapid adoption is the use of barcodes to process mobile payments. This requires software/hardware that can scan the barcode and process a payment – available already in many retail chains. The SMSGlobalExchange concept is ideally positioned to perform these features easily with many added applications and enhanced security including account storage or Exchange as opposed to calling it a Bank. Essentially a non profit organisation to provide humanity with an exchange for alternative units and low interest or free lending maintaining value and building wealth for all Users. To learn more please email us to access further information. We are also inviting developers to the project which will undertake a feasibility exercise to incorporate an independent satellite communications channel. Here is a link to an article from Mobile Commerce Daily. China is also embracing a NFC alternative form of mobile payments rapidly. This leads one to suggest – why change a nice mobilephone to one that has NFC capability at more cost and for merchants why upgrade to new terminals when your current model will likely do just fine? Another of interest application is Zidisha. Through this application investors can do business in emerging economies, micro-financing, tapping into the rapid adoption rates of mobile phone usage. for information on Zidisha click here.. If you are a developer wanting access to more information, Contact Us for details about this exciting development . Notice also that this technology also opens doors to more meaningful engagement with your target consumers by direct marketing opportunities to promote and develop your branding and provide information to users from a corporate social responsibilty perspective. Yet more strife with old card based systems is brewing right hear in New Zealand and Auckland buses – yet more costs and borrowing for taxpayers ( could it all be a huge game of debt and interest?). The problem seems to be that the New Zealand based card system is trying to integrate with a French international contractor using its own system. The answer is simply allow the French version to roll out without delay, use a more modern alternative for mobile payments that caters for ALL mobilephone users at little or no cost to comply.The message to all stakeholders is “wakeup” and don’t be fooled again. New ‘card-less’ technology and exposure of the truth should expose the cumbersome less agile Near Field Communication credit card-based systems into the past. Its ludicrous to even contemplate the thought, but then, as usual many just follow like a herd of sheep. Is it going to be costly to fix the blunders? – of course it is. Begs the question, why is it being pushed into the system in the first place. Who will pay for it ? – yes you are right again – the taxpayer? Its all about keeping nations in debt and under control. Update 3/2013 a great example of executive manipulation, why, Agenda 21 ? and corporate flaws is the NOVAPAY payroll system for education providers in New Zealand and Solid Energy mismanagement practices debacle here in New Zealand. This entry was posted in Bank Alternatives, Mobile Payments and tagged barcodes, mobile digital wallet, mobile payments, NFC. Banks encouraged to go Global.. The power of the smart phone or mini-computer is being realised by some mobile-payment conscious innovators. Swift are calling on Banks to initiate an open Global service api – funny that? Heres a link to the article at Finextra and the downloadable whitepaper . Problem is the Banks prefer to work with Cards all the time and the unsuspecting consumer and retailer is expected to follow lead and upgrade. Its a win win for Telco’s and Banks – or is it?. Mini-computers and or smartphones are much more intelligent than using NFC. Flexibility – no requirement for any card present related transactioning, the ability to transact in other forms of reward other than the promissory note eg TimeBanks. Even the text formats offline aspect is changing with smartphone use of voice activation technology – text by speaking into the handset microphone, the term is VEXT . An article by Amanda Kooser highlights an application developed on secure password authentication using VEXT technology. ANZ trialled a product using NFC but it turned out to be a failure in Australia where mobilephone covers were used to house the software. Heres what Apple co-founder Mr Wozniak thinks about the future of computers in a recent television interveiw while in Australia. FairGo gave an insight into creditcard fees also. This entry was posted in Bank Alternatives, Card Issuers and tagged Near Field Communication, NFC. Near Field Communication is being favoured by major stakeholders such as Card Issuers to maintain the card standard and is a form of contactless payments. However this requires a major upgrade to Merchant terminals and with the power of the internet many developer’s globally are addressing the opportunity by offering alternatives. Less costly options that are more secure and feature packed are however likely to contribute significantly to educated participants. Mobile EWallets that do not require the storage of Card or Bank details in apps making them instantly attractive to the security conscious . Here is a recent article on techcrunch which raises valid questions around the adoption of Near Field Communication tap and pay or contactless card payments . This is intended to be introduced in New Zealand in future but the terminal upgrades required will hinder this and especially where more “modern” technology is available with less disruption and significantly lower compliance costs and yet a higher more flexible level of technology. 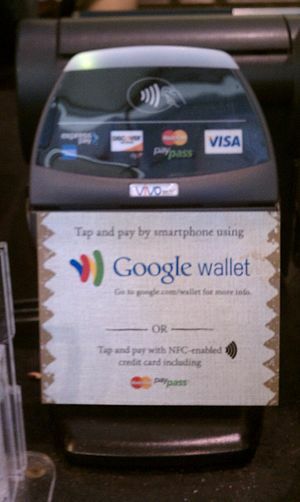 Google Wallet is yet another roll-out by Google but, do you really want ‘to put all your eggs in one basket’ so to speak? Google are rather obscurely obtaining cellphone numbers to reset lost Google account passwords. Crikey what are the ‘motives’ for these tycoons? Is good or is it bad in the form of some monopolistic control. PaybysmsGlobal, a not for profit concept, is set to provide high technology solutions or simpler alternatives that do not require the use of any card or even clearing houses or Banks. This entry was posted in Banks, Mobile Payments and tagged ewallets, Google Wallet, NFC. SMSGlobalExchange. A concept that is being developed for universal application owned by the Users. Effectively non profit, minimal fees and interest free lending as defined by Users. Fees are applied to application development and maintenance, everything is transparent. Our concept embraces alternative units of exchange including but not limited to Time Banks, interest free loans and local currency thereby encouraging Global connectivity that is not burdened by debt created by interest. True value is maintained for the benefit of Users, their labour and products as opposed to the outgoing standard of foreign control, selective ownership and manipulation. With emphasis on mobile connectivity Users have access to all information and exchange facilities at anytime. Near Feild Communication (NFC) “contactless card or Bank on phone” solutions require close or nearby interaction between a compatible mobile, card and terminals as opposed to SMSGlobalExchange which can transact remotely from “anywhere to anything” as well as NFC where demanded for transitional periodsJay Donovan at techcrunch gets a quote from Richard Crone CEO at Crone Consulting LLC in USA “the entrenched stakeholders ( the card networks and the mobile networks ) would like you to believe that NFC capable phones for payments is an inevitability and a necessity – the evolution of modern payments? the truth is that NFC payments is actually an outmoded concept that really isn’t needed. A remnant of our offline past when storing actual card data in secure element hardware, was actually necessary. It can all happen in the cloud these days.” With a future vision EWallet solution such as SMSGlobalExchange a common unit of exchange free from profit orientated central reserve Bank corporations or traditional debt laden Bank environments and excessive fees like anz.co.nz or westpac.co.nz or even kiwibank.co.nz. This means that the ability to transact remotely and in the cloud Globally is a distinct advantage compared to NFC solutions. (Update Australian Banks are to be sued for charging penalties illegally – register at http://www.fairplayonfees.co.nz ) Just think if you could live debt free enjoying life as it should be, healthy and enjoying innovation derived from a global cooperation. How more productivity and creativity can be exponentially advanced without manipulation. In high volume transactioning NFC works well and smartphone developers are addressing this with alternatives such as Quick Response Codes. For many merchants we advise that before you invest in NFC that you consider other options to avoid disappointment or changes to currency units of exchange and unecessary cost. Further discussion in recent times at a USA summit with the Federal Trade Commission certainly indicates that ” key stakeholders” are keen to maintain a strategic model of control. From a community perspective local currency alternatives are great providing “real” wealth to members. Scribe Deirdre Kent released a fantastic publication – Healthy Money Healthy Planet examining alternative currency matters. With the likely collapse of interest laden promissory notes printed by Reserve Banks SMSGlobalExchange invites a Global community to become Users and effectively the owners by simply opening an account and using it. We are developing an entirely different community model with complete transparency to all account holders. No hidden fees or even interest on loans thereby creating a debt free environment. If you are a Developer keen to join the development please contact us. This entry was posted in Mobile Apps, Mobile Payments, SMSGlobalExchange and tagged Contactless Payments, Near Field Communication, NFC, SMSGlobalExchange, social media.